As we post this blog the latest (and 200th) issue of Future Music has just hit the shops. For this issue we did a highly enjoyable collection of samples harking back to the early days of sound design and the work of the legendary BBC Radiophonic Workshop. To emulate the basic sorts of tools the workshop had to hand, we cut down on all the modern (and vintage) sound sources available to us and tried to strip it all back to basics. 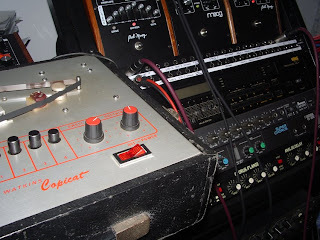 Because we didn’t have access (or the time - we have quite tight deadlines to work to) to an audio test oscillator, the main source of early Radiophonic tones, we ended up using our battered Akai S01 samplers’ built in test tone as our main sound source. This Innocent enough sine wave was then sent through all the vintage effects and transposed up and down in pitch by hand on the fly. As well as the tape delays and spring reverbs we heavily used the moogerfooger ring mod as both a sound source and effects box. Pretty much everything got shoved through it in the end. We wanted to do some cheesy Dalek vocal samples as well, the current DR Who uses the moogerfooger ring mod, but it was only after a couple of hours that we realised how important the voice of the actor was in making the whole thing sound right (and not crap). Unfortunately we didn't get beyond crap so they got binned. If we'd have had more time it would have been fun to try getting into some tape loops and such like - maybe next time. The Groove Criminals are a sample production team based an underground beat-bunker buried in wilds of deepest Suffolk (UK). Led by programmer, producer and occasional deejay MR Hoodee, The Groove Criminals provide copyright free sample material in a huge variety of styles including regular monthly sample contributions for the cover-mounted DVDs of both Future Music and Computer Music magazines, as well as sample CDs and music software. In addition to making samples, The Groove Criminals work as freelance music tech journalists, produce and release the odd record, and can be occasionally found jostling old ladies in the charity shops of East Anglia searching for rare easy listening LPs.